Executive Function skills are self-management skills that help students (and adults) achieve goals. In order to be effective, students must be able to manage their emotions, focus attention, organize and plan their work and time, and reflect upon and revise their tactics as circumstances change. 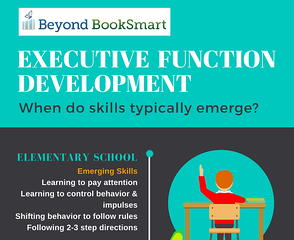 As the demands of school increase each year, having well developed Executive Function skills becomes critical in order to perform well in school. Students who have been diagnosed with ADHD and/or other learning differences often have Executive Function challenges; however, students need not have a formal diagnosis to struggle in this area. Students are expected to have well developed Executive Function skills by the time they reach high school, but these critical life skills are not typically taught in elementary school or middle school. With expert guidance and structure, students can learn to effectively manage themselves so that they are equipped for taking on challenges in school or in life. Consistent academic performance requires stamina, which is built on a foundation of solid Executive Function skills. What Executive Function skills do students need? Our Executive Function coaches are carefully screened, highly trained, and ready to work face to face online or in person with students who are experiencing challenges in any of the areas listed above. Beyond BookSmart is the nationally recognized expert in helping students become more effective learners. We have helped thousands of students gain the skills they need through our revolutionary approach to changing habits and our comprehensive database with over 375 tools and strategies. What is the Timeline for Typical Development of Executive Function Skills? Download our colorful infographic to learn more about EF development from elementary school to adulthood. When children have opportunities to develop executive function and self-regulation skills, individuals and society experience lifelong benefits. These skills are crucial for learning and development.